Before visiting the National Media Museum to see Fay Godwin's latest photography exhibition, I didn’t know a whole lot about her apart from the fact that she was supposedly a ‘landscape’ photographer (although much of her work appeared not to be) and that she influenced many other landscape photographers of her era. After seeing this exhibition though, my mind has been comprehensively changed. She most definitely is a landscape photographer and in my mind it is in this ‘mode’ that she shines - one of only a few professional landscape photographers of that era. The following is an account of my research about Fay and an overview of the exhibition. I’d like to start with a little bit of background about Fay though. Born in Berlin in 1931, Fay grew up in various countries having a British diplomat father and an American artist mother (of Scottish ancestry). They were posted to various countries and this multi-cultural, upper class, artistic environment created a passion for the contemporary arts and literature that permeated her life. She finally settled down in London at the age of 21, living a bedsit life but spending most of her time travelling Europe as a travel representative. After six years of this continuous wandering, she took at job at a publishers where she was in charge of commissioning book covers and typography (another design influence! - ed). This background, that surely influenced her later reputation as a stickler for perfection in her own books also introduced her to her husband, a publisher of some renown who worked in literary publishing. The contacts that her husband’s business created were to be very useful to her in later life. Although she was taking pictures of the children during as they grew up, it was only in 1966 that she started to look at photography as something more serious and an investment in a small darkroom with enlarger set the scene for her self tuition. Three years later, her marriage had broken down (is this something to do with photographic obsession - hope not - ed) and her husband told her to get a serious job as a ‘secretary or something’. The nascent feminist in Fay took arms against this attitude and took out a loan on the best camera she could buy (a Leica) and started touting her skills as a portrait photographer, using her publishing contacts to get work. For over five years she built her reputation but wanted to move into other areas of photography (she said that if she didn’t have children she would have wanted to be an adventure photo-journalist). Unable to make herself available at a moments notice, as a freelance photographer of the time must, she worked out that books were the way forward. Having already had a disappointing experience has supplying photography for one book, she started to propose book ideas to her old publishing contacts. This eventually led to her first book on the North Wessex Downs and the Chilterns, “The Oldest Roads - An Exploration of the Ridgeway” published in 1975 when she was 45 years old. It was this year that Bill Brandt included her in his “The Land” exhibition which have her art profile a big push and validated her landscape photography work. Her husband died in the next year and she was also diagnosed with cancer. It was after this period that the landscape became more prominent to her, although it should be said that she was a keen walker before that and would often take her camera with her. An aside during a portraiture assignment with Ted Hughes in 1971 about potentially photography the Calder valley led Fay to photograph this area for the next seven years. She finally met up with Ted again in 1978 (a year when she also won an Art’s Council grant) and they finalised the collaboration with the book ‘Remains of Elmet’ (republished as just ‘Elmet’ with additional photography and a book that Fay said she would like to be remembered by). Fay worked in the landscape for the next 6 years and It was her “Land” book and exhibition that brought her fame. The book put together all of her work from the previous decade and even though the Art’s Council had funded her with a substantial grant, the project took an enormous effort to get off the ground (never mind the problems with huge batches of Ilford and then Agfa film not working, she finally got recompense but lost many trips worth of photography). A sponsorship by CAP (I’m presuming the CAP from CAP-Gemini, the consulting group) helped make it happen in the end and the result was a true celebration of landscape. You wouldn’t think that it was so beautiful if you heard Fay talk about it though. Despite being considered by most landscape photographers as the pinnacle of her career (and she herself admitted to it being her best work) she went on to reject the notion of beauty and landscape, even going so far as to stating that her photography did not fit anywhere in the ‘sublime’, romantic tradition (although I have my suspicions she either didn’t understand the term - unlikely - or chose to reject it because of the art establishments attitude towards it). It seems to me that she was seduced by the art world and her photography started to change at this point. In later life Fay even rejects the term ‘landscape photographer’, insisting that she is a documentary photographer - someone who reports on the landscape. This could be just a burgeoning politicisation but I find it difficult to believe that such a dramatic change in character should appear at such a late stage in life. She was quite well known as a ‘difficult’ woman, one publisher she encountered described her as a ‘severe young lady’ and I think this abrupt nature contributed to her reactionary comments about landscape photography. Whatever the reason, her photography now become more dedicated to documenting the abuses of the landscape with the odd surrealist Bresson like aside. This output was probably also triggered by her appointment to the presidency of the Ramblers association and the issues around the sell of of the countries forests (something we’re becoming equally attuned to at the moment). There was a mass politicisation of the walkers movement at that point with mass trespass occurring on a regular basis and the “Forbidden Britain” campaign was started. This campaign was an obvious one for Fay to support and she has said in later interview that it was her best method of supporting the cause. The book that followed “Our Forbidden Land” was voted ‘green book of the year’ and documented the current and historic closures of land, from highland clearances to the Thatcher governments sell-off of 40% of the publicly owned forests in Britain. This work was very important for it’s time but I think the negative side of it is the retrospective effect on her earlier landscape work. The great work that was made in representing landscape as a valid art was reduced by it’s reinterpretation as political commentary. The strength of work in skill and composition reinterpreted as a some sort of documentary commentary. Not that we should think of this later work as ‘bad’ though - it is just as important in it’s own way as the earlier work (and we shouldn’t forget her documentary work in factories from the 1960’s) but they are very different in intent and execution. Fay was a pure landscape photographer turned contemporary environmental photographer. And so the exhibition! Well, like I said at the start, I wasn’t expecting a lot out of it but just looking at the first couple of pictures changed my mind. These are beautifully printed objects (which I presume are printed by Peter Catterel) and the first two, images of the Glencoe valley from the Buachaille end, have a wonderful luminosity. I went to see the Ansel Adams exhibition in Wolverhampton and I have to say I preferred the printing here. What came across most thought was the use of sky and light in her pictures. You can tell by looking at multiple pictures that there is a consistently beautiful timing in capturing a sky that supports the rest of the picture. Even if it’s just an accenting cloud over a key feature it works well but most of the time the sky becomes a fully featured part of the final work and the sense of harmony this gives is wonderful. This is a large exhibition, the pictures are only about 14” in size and are fairly closely spaced but this flow of images starts to give you a sense of her consistent vision at this point in her life. There are a couple of feature stands, one showing Fay’s old Leica and Hassleblad cameras (atlhough I could see no Leica pictures in the exhibition) and the other more interesting feature is a folder of her contact prints and printing notes. It was very interesting to see how she approached a subject, in this case the photograph of the lone tree paddling at the edge of a lake in Cumbria. She readily admits to producing a lot of film and of taking many versions of her shots but I was surprised to see how many variations she had shot of this tree. You almost could read the flow of though - one shot centering the tree, one shot with more space on the left, one with more on the right, one with space at the top, move to the right and realign the background and centre the tree, one more space left, one more space right, one with more branches at the top. This isn’t the sort of ‘scattergun’ approach you would expect but it obviously works. Perhaps it means that she was still experimenting, working around different compositional ideas, or that if she had the time she would work a subject intensely. It also suggests that a lot of her skill was in the editing process, selecting pictures that matched the mood she saw at the time. The exhibition also has a couple of videos and a selection of books to browse through (with a full length video of her South Bank show feature in another room). The videos are enlightening and well worth a watch. Not all of the pictures will excite the typical landscape photographer, a few take some looking at before they reveal things and some didn’t reveal anything to me at all. However, a good majority I connected with in some way, appreciating what she might have been trying to capture and enjoying the act of interpreting. As a last observation, it is interesting that as she nears her own ‘back yard’ (the South) she stops taking pictures of the ‘wild’ and the hand of man starts being introduced and her compositions often become more ‘difficult’ to interpret. Is this the budding photojournalist asserting control? I don’t know but having commented on the direction her photography took after this book/exhibition, I should probably say that you can see a germ of those ideas towards the end of her decade in the landscape. The most successful of these to me, a pair of facing pictures in the book, are of some discarded pallets near Faversham and an abandoned Mini in a lke at Cliffe Lagoon. These pictures show a wonderful crossing over of her compositional, landscape oriented side and her photo-journalist side - pictures that make you want to look longer for their beauty and balance but that still communicate an opinion on the disfigurement she sees; almost reminding me of the way Burtynsky combines photographic vision and environmental message. I am not criticising her later work, however this exhibition has shown me a side of Fay Godwin that I missed when looking at pictures found one by one on the Internet - I'm a landscape photophile after all. 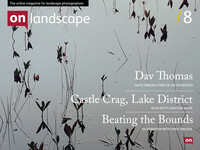 Finally, the book “The Land” is well worth purchasing (there is a more detailed review in another article in this issue) - my copy was bought for £8 from Abe Books (http://www.abebooks.co.uk) and as far as I can tell contains all of the photographs from the exhibition and a few more. Landmarks, a retrospective of her life’s work, is a very well produced book but for the landscape photographer, hunt down a copy of the “The Land” to appreciate her skills and vision as a landscape work. Oh, and get to see the exhibition if you can - it’s really worth it if only to get a true flavour of one of Britain’s most lauded landscape photographers. If you want to see more work from Fay Godwin’s contemporaries, try looking up Paul Hill and Raymond Moore who worked at the Photographer’s Place and also John Blakemore (who is lecturing at the re-opened Photographer’s place in March I believe). Fay achieved a lot more recognition than these photographers possibly because of her more documentary nature in later life, useful publishing and literary contacts and because she was one of the only women photographers around during the height of feminist politics in the 70’s and 80’s. It has also been said that she was influenced by Ansel Adams, Bill Brandt, E. Chambre Hardman and Paul Strand. National Media Museum (internal page) - Fay Godwin talks about the original Land exhibition.